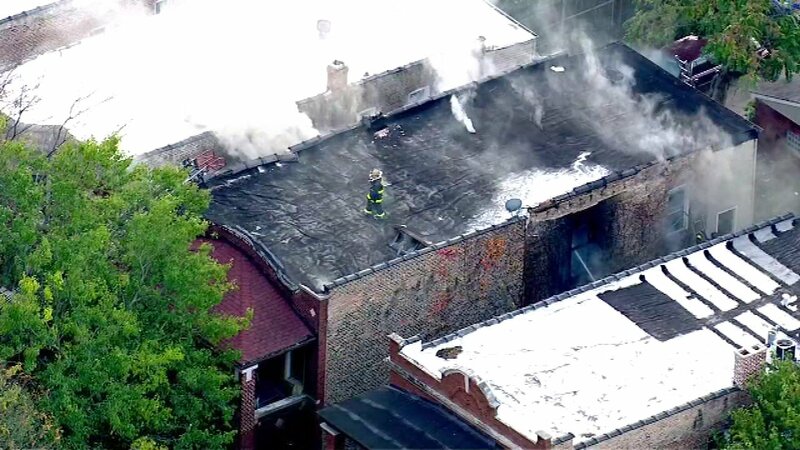 CHICAGO (WLS) -- Chicago firefighters responded to a blaze at an apartment building in the city's South Austin neighborhood Friday afternoon. The fire in the 150-block of North Lamon Avenue emitted thick clouds of white smoke. Fire officials said the blaze was struck out around 4:15 p.m. Firefighters have not released any information on the cause of the blaze. No civilian injuries have been reported, but officials said one firefighter was sent to a local hospital with non-life threatening injuries. Fire officials said firefighters were on the second floor of the burning home when there was some type of air blast and one of the firefighters was knocked off his feet. He hit his head. He is conscious and alert, but was taken to the hospital for treatment.